Poor drainage and low spots can lead to rainwater contributing to flooding and soggy spots in the yard. Since water follows the natural downward flow of the land, some simple redirection can help keep it moving off your property. In some cases, the best way to keep your yard from flooding will involve more than one method of controlling the rainwater. 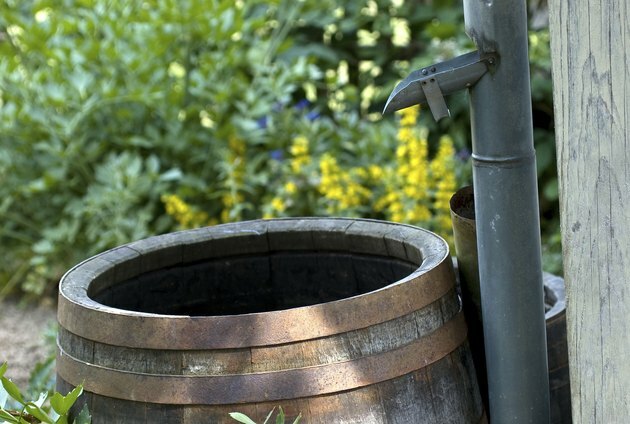 One way to deal with rainwater is to collect it in rain barrels. If the rainwater tends to pool near your downspouts, consider extending them to lead the water away from the affected area. Add a longer section to the end of the downspout to keep water away from the house. You can extend the flow of water out of the downspout even more with a rock channel. Build a narrow channel extending beyond the end of the downspout. Use bricks or pavers to form the sides of the channel. Fill the middle with river rocks. A swale or dry creek bed is an option for directing water through your yard. This option works well on sloped areas or ditches where the water pools. The swale follows the natural contours and slopes in your yard. This means it will likely curve or wind like a creek rather than form a straight line across the yard. The area should have soil that drains well. You can also install a drainage pipe underneath to help control heavy rainwater. Often, river rock is placed in the channel to help guide the water. You might also place plants along the swale to further help contain the water flow. French drains and catch basins are two underground options for directing water away from your yard to prevent flooding. French drains are pipes with perforations that are buried about 18 inches deep, surrounded by gravel. The pipe generally goes in a ditch or low-lying area so the water naturally seeps into it. A catch basin is a box with a drain on the top and an outlet connecting to a pipe at the bottom that directs water away from the yard. The catch basin goes in a low-lying area of the yard where the water naturally pools. A rain garden is a special landscaped area where the water tends to pool in your yard. It needs highly permeable soil so the rainwater can easily soak down through the surface. You'll need to amend the soil at least 18 inches deep with a mixture of topsoil, sand and compost. A layer of gravel or sand below the amended soil also helps with the drainage of the water. Choose plants native to your area so they are better suited for the amount of rainfall you receive. How Deep Should You Install French Drain Pipes?